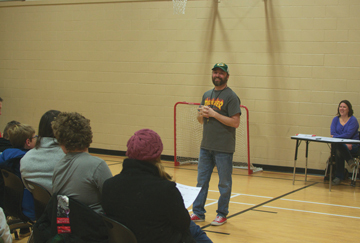 PROVIDING MORE RECREATION IN REDCLIFF: Tim Reimer talks about the Southern Alberta Cliffers Basketball program at an information night at Margaret Wooding School on Jan. 10. The Redcliff Youth Basketball programs has been developing young school-aged players in the town for over 20 years. Now heading into the 2019 season, the basketball program has been renamed to Southern Alberta Cliffers Youth Basketball to attract players from not just the town, but from places in the surrounding area. “To include the other communities because it’s not just Redcliff,” said Tim Reimer, program organizer, of the name change. Groups are split into Grades’ 2 and 3s, Grade 4 and 5s and Grade 6 and 7s. The hoops session gives the players a chance to develop through school, he added. “They’re going to be playing basketball at Parkside and then on to Eagle Butte,” he said. Coaches are Todd Regier from Seven Persons, Margaret Wooding’s Karn Bongaards, Ralston School’s Tessa Tuff, who grew up playing basketball in the area and brings a wealth of experience. Medicine Hat College Rattlers players and coaches will be making appearances. Stretching, running, ball handling, coordination are basic skills that will be taught. The sessions are based out of Margaret Wooding School and it is a great way for kids to be with their peers, develop bonds and relationships playing as one team, learning how to respect teammates, coaches and officials. “They develop a lot of confidence,” said Reimer. The goal is to get 120 kids to exceed last year’s 80 with four teams per group. Registration is on Jan. 22 and 23 at the Redcliff library from 6p.m..- 8 p.m.
Evaluations begin on the week of Feb. 11. Practices will begin on Feb. 25 and go from Monday to Thursday starting at 5 p.m.
Games will run for seven consecutive Saturdays starting on March 2 at 9 a.m. and running until 3 p.m.